Man, do I love a tart. And considering how much I love leeks and adore goats cheese, this is an absolute winner in my books. The recipe comes from an old Gourmet Traveller or Vogue Entertaining, I’m afraid that is as much as I remember so my sincerest apologies to the original author. Allow to cool slightly then serve with crusty bread and a cracking great green salad. I made this for our recent family reunion – 44 people for lunch – at which several people had a variety of dietary constraints including coeliacs disease. I made this with the gluten-free pastry and it was an absolute hit. Oh, I also couldn’t get white asparagus so just used green, laying them on top in a alternating pattern of the tips and part of the spear. And as you can see from the picture this is it uncooked. I forgot to take a photo of it cooked. Whoops. Just imagine it golden with the ricotta mix puffed up and golden and the spears cooked. Bake for 30 minutes or until golden, serves 4-6. * or use a pastry of your choice. The gluten-free pastry I use I don’t blind bake but if I was using the sour-cream shortcrust or standard shortcrust I would. Now look, my limited experience of a wheat/gluten free diet was traumatic and blessedly brief (a few years when Oscar was little and we embarked on a low-allergy diet as part of the Blitz that was trying to limit the impact his dodgy chromosome would have on him – as if we could trick genetics) but I made this last week for some vegetarian tarts I was making for the 2009 Family Reunion as some of Mum’s family have coeliac’s disease. It is a Maggie Beer recipe from her wonderful book Maggie’s Kitchen. In terms of full disclosure, I should confess here that my adoration of all things Maggie is bordering on creepy – the woman is a true national treasure. As with her sour cream pastry it is an absolute dream to work with and tastes fantastic. I am presuming the tiny amount of xanthum gum goes a long way to stabilising the dough because it just comes together a treat. A word of warning though – Maggie stipulates you may not need all the eggs and in my experience you won’t. And don’t be tempted to add one more dash – I did and made it far too wet. Just go with your gut on this one. Oh, Maggie also says you can use a gluten-free flour from the supermarket or equal amounts of potato flour, rice flour and maize flour. I did the latter and it was fabulous. 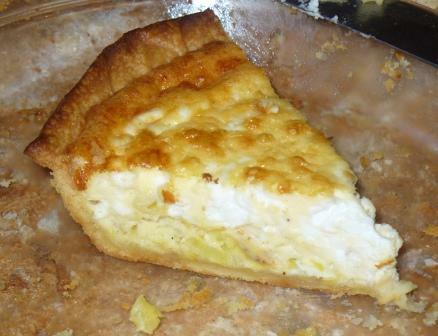 * when I used it with quiche-like fillings I baked it for 35-40 minutes at 180C and it came up a treat! OH DUDES AM I BACK! After quite the hiatus this month I resumed the mantle that is a Daring Baker and well, if it wasn’t irony I don’t know what it was. The challenge posted to us all by A whisk and a spoon was to create vol-au-vents. VOL-AU-VENTS! Forget your initial ‘how retro’ reactions and move straight to the O.N.E. pastry, about the O.N.L.Y. recipe I shy away from and definitely one I have never ever made or attempted and VOILA! You have puff pastry. I just thought it would be fiddly and hard and a disaster waiting to happen. DUDES – having made them today I realise that fear has lost me a good FIFTEEN years of puff pastry goodness. Oh look, I know I know, the lovely little layers you’re meant to see are not there, but this was my first attempt and it tasted divine and was still quite flaky. Best of all? It is so GODDAMN easy. No really, it is. And you know what? Home made puff pastry is seriously up there in goodness and flavour and nomnomnomness. Like, the Mt Everest of home baking. I’m still on quite the high. Go watch this video for a Julia Childs hit and for technique. Put the all-purpose flour, cake flour, and salt in the work bowl of a food processor fitted with a metal blade and pulse a couple of times just to mix. Meanwhile, place the butter between 2 sheets of plastic wrap and beat it with a rolling pin until it flattens into a square that’s about 2.5cm thick. Take care that the butter remains cool and firm: if it has softened or become oily, chill it before continuing. Unwrap the dough and place it on a work surface dusted with all-purpose flour with your rolling pin, press on the dough to flatten it and then roll it into a 10″ (25cm) square. Keep the top and bottom of the dough well floured to prevent sticking and lift the dough and move it around frequently. Starting from the center of the square, roll out over each corner to create a thick centre pad with “ears,” or flaps. Place the cold butter in the middle of the dough and fold the ears over the butter, stretching them as needed so that they overlap slightly and encase the butter completely. If you have to stretch the dough, stretch it from all over; don’t just pull the ends you should now have a package that is 8″ (20cm) square. Gently but firmly press the rolling pin against the top and bottom edges of the square (this will help keep it square). With this first roll, it is particularly important that the butter be rolled evenly along the length and width of the rectangle; check when you start rolling that the butter is moving along well, and roll a bit harder or more evenly, if necessary, to get a smooth, even dough-butter sandwich (use your arm-strength!). With a pastry brush, brush off the excess flour from the top of the dough, and fold the rectangle up from the bottom and down from the top in thirds, like a business letter, brushing off the excess flour. You have completed one turn. Rotate the dough so that the closed fold is to your left, like the spine of a book. Repeat the rolling and folding process, rolling the dough to a length of 24″ and then folding it in thirds. This is the second turn. If the dough is still cool and no butter is oozing out, you can give the dough another two turns now. If the condition of the dough is iffy, wrap it in plastic wrap and refrigerate it for at least 30 minutes. Each time you refrigerate the dough, mark the number of turns you’ve completed by indenting the dough with your fingertips. It is best to refrigerate the dough for 30 to 60 minutes between each set of two turns. The total number of turns needed is six. If you prefer, you can give the dough just four turns now, chill it overnight, and do the last two turns the next day. Puff pastry is extremely flexible in this regard. However, no matter how you arrange your schedule, you should plan to chill the dough for at least an hour before cutting or shaping it. -Not to sound contradictory, but if you chill your paton longer than the recommended time between turns, the butter can firm up too much. If this seems to be the case, I advise letting it sit at room temperature for 5-10 minutes to give it a chance to soften before proceeding to roll. You don’t want the hard butter to separate into chunks or break through the dough…you want it to roll evenly, in a continuous layer. -Roll the puff pastry gently but firmly, and don’t roll your pin over the edges, which will prevent them from rising properly. Don’t roll your puff thinner than about about 1/8 to 1/4-inch (3-6 mm) thick, or you will not get the rise you are looking for. –Homemade puff pastry is precious stuff, so save any clean scraps. Stack or overlap them, rather than balling them up, to help keep the integrity of the layers. Then give them a singe “turn” and gently re-roll. Scrap puff can be used for applications where a super-high rise is not necessary (such as palmiers, cheese straws, napoleons, or even the bottom bases for your vols-au-vent). Using a knife or metal bench scraper, divided your chilled puff pastry dough into three equal pieces. Work with one piece of the dough, and leave the rest wrapped and chilled. If you are looking to make more vols-au-vent than the yield stated above, you can roll and cut the remaining two pieces of dough as well…if not, then leave refrigerated for the time being or prepare it for longer-term freezer storage. See the “Tips” section below for more storage info. On a lightly floured surface, roll the piece of dough into a rectangle about 1/8 to 1/4-inch (3-6 mm) thick. Transfer it to the baking sheet and refrigerate for about 10 minutes before proceeding with the cutting. Make clean, sharp cuts and try not to twist your cutters back and forth or drag your knife through the dough. Half of these rounds will be for the bases, and the other half will be for the sides. Using a ¾-inch cutter for small vols-au-vent, or a 2- to 2.5-inch round cutter for large, cut centres from half of the rounds to make rings. These rings will become the sides of the vols-au-vent, while the solid disks will be the bottoms. You can either save the center cut-outs to bake off as little “caps” for you vols-au-vent, or put them in the scrap pile. Bake the shells until they have risen and begin to brown, about 10-15 minutes depending on their size. Reduce the oven temperature to 350ºF (180ºC), and remove the silicon mat or parchment sheet from the top of the vols-au-vent. I filled mine with some left-over chicken pot pie filling (recipe to come) I had in the freezer. 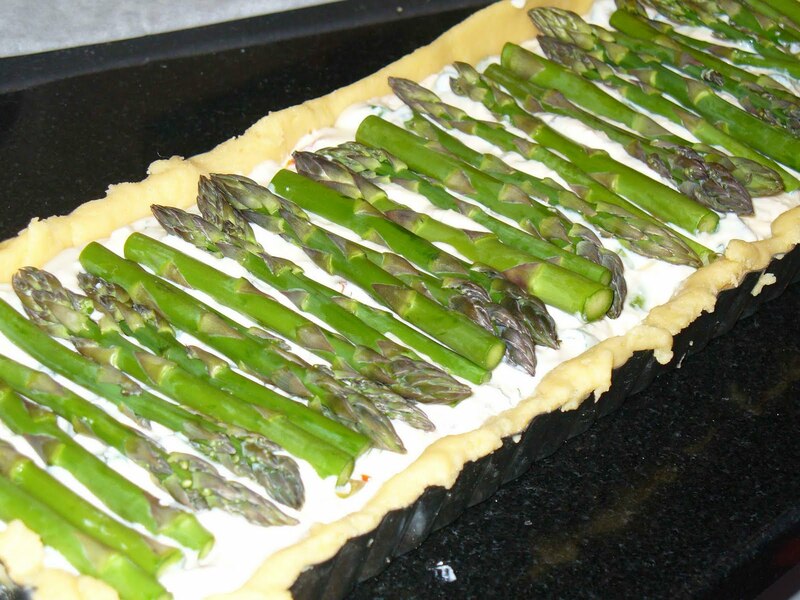 I topped it up with some additional cream and young asparagus spears. DIVINE.